Here are lists of older articles about climate change. Looking at you will notice that we have long worried about climate trends, and even experts have often (not always) written with what we can now see was excessive certainty. I believe this climate trends will be one of the major factors affecting geopolitics in the 21st century. The primary message I hope people take from this list of articles — and the posts based upon them — is that there is debate among scientists about these things — and that the science is rapidly progressing to provide answers. This page lists the articles mentioned in posts on this site, and are only a tiny fraction of the climate change literature. This Website created by Spencer Weart supplements his much shorter book, which tells the history of climate change research as a single story. On this Website you will find a more complete history in dozens of essays on separate topics, updated annually. A Bibliography by year of climate science research (also from AIP) — the most complete I have seen. “The Origins of a ‘diagnostics climate center“, Robert W. Reeves and Daphne Gemmill (NOAA), 20 October 2004 — Looks like slides for the above presentation. Note: if no link is given, this is an unverified reference from a secondary source. “The Present Interglacial, How and When Will it End?”, Science, October 1972 — Summary of conference held in January 1972 at Brown U. “Brace Yourself for Another Ice Age”, Science Digest, February 1973– See photo copy of the article here (7 meg). “Climate Changes Endanger World’s Food Output”, New York Times, 8 August1974 – Picture of article. “A Reassessment of Atmospheric Pollution as a Cause of Long-Term Changes of Global Temperature“, J. Murray, Mitchell Jr., in Global Effects of Environmental Pollution, edited by S. Fred Singer. Dordrecht: Reidel. (1975). “Understanding Climate Change: A Program for Action”, National Academy of Science, 1975 — Not online. Used copies can be purchased. An oft-misrepresented balanced review of cooling and warming forces. 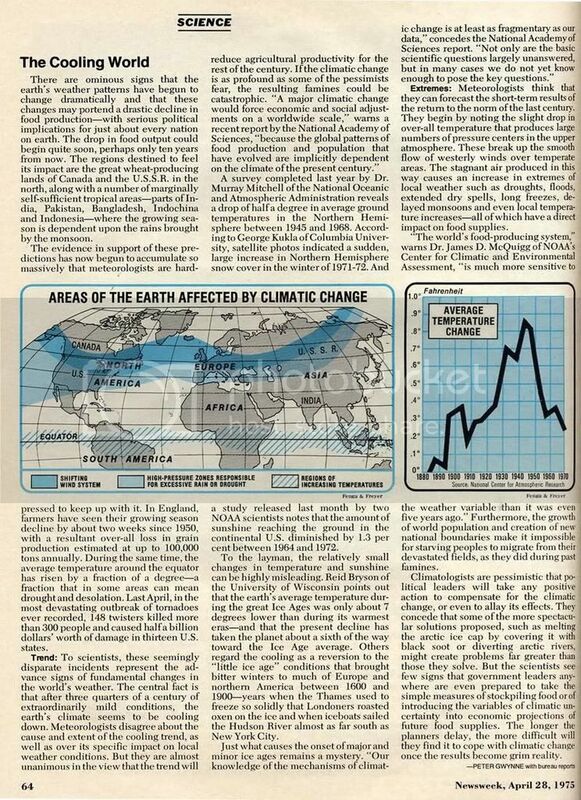 “Climate Changes Called Ominous”, New York Times, 19 January 1975 — Picture of article. The Cooling, Lowell Ponte (Prentice Hall, 1976) — Not impressive; widely misrepresented by climate sketpics. Interview with Professor Reid Bryson in Mother Earth News, March/April 1976 — Wikipedia entry for Bryson. Althought your above list may not intend to be complete, there is an article not listed: 1923, Chicago Tribune, “Scientist Says Arctic Ice Will Wipe Out Canada.” I’m not sure of the exact date, but the article is referenced in the book, “Cool It . . .” by Bjorn Lomborg (pp 126). FM reply: There are many lists of such headlines, such as this one. They don’t cite sources, so I don’t list them. “Scientist says Arctic ice will wipe out Canada.”, Chicago Tribune, 9 August 1923 — Statements by Professor Gregory of Yale University, American representative to the Pan-Pacific Science Congress. Background information: Second Pan-Pacific Science Congress was held 13 — 22 August 1923 in Melbourne, Australia and 23 August — 3 September 1923 in Sydney. See their website here. FM reply: The 1976 CIA report might be “Potential Implications of Trends in Population Growth, Food Production, and Climate.” The data I have is August 1974, but that might be incorrect (I don’t have a copy; there’s nothing on Google). It fits the description.